THE secret to long-term weight loss success is to include the food you enjoy. Knowing how to make your favourites into low fat versions will help you to enjoy your food and not feel deprived. Making simple changes to how you cook can achieve not only major health benefits but also lose those unwanted kilos. 1. Put the dripping and butter away and instead use cooking sprays where possible, spray instead of soak or use baking papers, which are very good. Give the deep fryer away and instead grill, BBQ or bake. A good example of how you can make crumbed fish or chicken is to beat an egg white with a little skim milk, dip in egg mix then roll in bread crumbs until coated well. Heat a good quality non-stick fry pan and coat generously with cooking spray. Spray over the top of the fish or chicken and place this side down to cook first. When ready to turn spray top of crumbs and then turn to cook. Don't have the gas or element too high so to avoid burning. 2. Many dishes taste good because they are loaded with lots of fatty ingredients. To make a dish come alive I love to use fresh herbs and spices to enhance the flavour, such as basil, coriander, mint and parsley really. When using dried herbs you need to use sparingly as they can be quite strong, so start small and work your way up. My favourites are cumin, coriander, basil, oregano, turmeric, paprika, tarragon and chilli. 3. Low fat baking can produce heavy cakes so to avoid this happening add bicarb soda. I also use 1/2 cup of apple sauce (in jar) instead of oil or butter in a cake or batch of muffins. Add the bicarb soda to the apple sauce (it will froth). Apple sauce gives the moisture that butter or oil would normally give, but has no fat so this is a great way to cut down the fats when baking. 4. Another way to enhance a dish is to use salt reduced stock powders. Be careful you don't overdo it as they still have quite a high sodium count and don't forget a little freshly ground pepper can really add flavour to a dish. 5. I love using evaporated light milk to make creamy sauces. Thicken with corn flour and remember it may separate if you over-boil the milk. You can use the canned milk to replace cream for most sauces and also in some desserts. Annette's cookbooks SYMPLY TOO GOOD TO BE TRUE 1-6 are sold in all good newsagencies. Visit Annette's website symplytoogood.com.au for more tips and recipes, and join Annette's Facebook page at Symply Too Good. Peel and thinly slice potatoes. 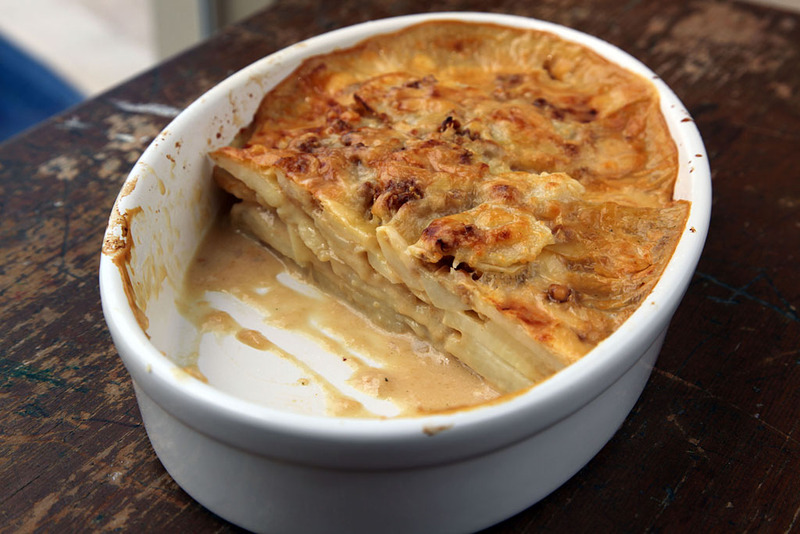 Spray a medium size lasagne dish (28cm x 19cm) with cooking spray then layer sliced potato over base of dish. Cling wrap dish then place in microwave and cook on HIGH for 5 minutes. Remove from microwave and take off cling wrap. In a small mixing bowl combine milk, soup mix, garlic and parmesan cheese. Pour over potato slices then top with grated tasty cheese. Bake 30-35 minutes or until cheese is golden brown on top. Suitable to be frozen for 2 - 3 weeks. I know how much everyone loves my Potato Bake in Symply Too Good To Be True 1 so I thought why not give you another version to enjoy. A normal potato bake is so high in fat but this recipe is both low in fat and yet tastes amazing! Having some carbohydrate at each meal is important for people with type 2 diabetes and those wanting to manage their weight. Carbohydrate breaks down to glucose in your blood. Distributing your carbohydrate intake throughout the day gives you body the best chance of stable blood glucose levels.